Roux is a French word and refers to a combination of a lipid (fat or oil) and flour and is a key ingredient in, probably, thousands of dishes involving some sauce. 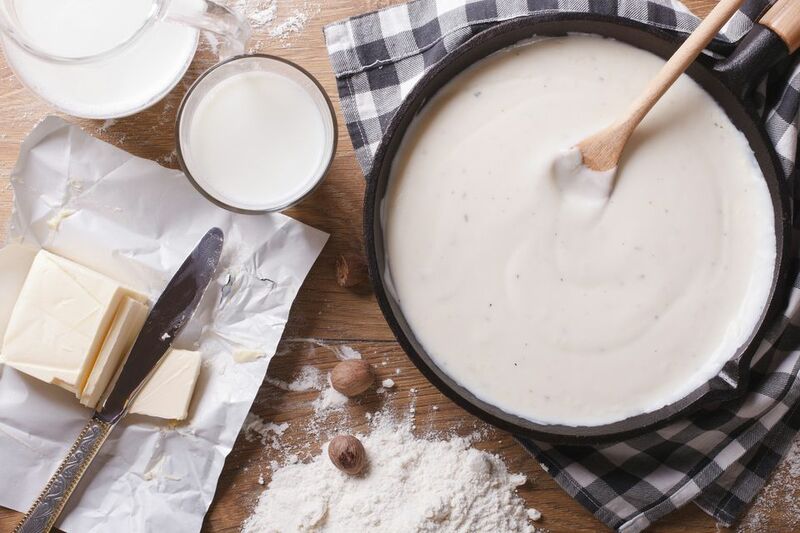 Roux is the thickening agent in Mornay sauce (the basis for mac-n-cheese), brown sauce (beef or turkey gravy), and, though it isn't obvious, beef stew. Once the flour is completely dissolved in the oil, you whisk in liquid (broth, stock, milk, cream) and as the oil surrounding the flour granules loosens its grip on the flour, the gluten in the flour grains begins binding with the gluten in other grains, thickening the sauce. But the roux itself is just the combination of fat and flour. Melt 3 tablespoons of unsalted butter over medium-low heat in a saucepan until bubbly and stir frequently to avoid burning. When butter is melted, add 3 tablespoons of all-purpose flour and whisk to combine thoroughly. Meanwhile, warm two cups of milk in the microwave until barely too hot to touch (about 2 minutes on high-125 degrees). Whisk in the milk, first half and as it begins thickening, another half of what remains, and then the last. Increase heat to high medium and continue cooking, whisking frequently, until it begins to bubble. If you want a thinner sauce, reduce butter and flour to two tablespoons, for a thicker sauce increase them to 4 tablespoons. But this proportion works well if you're making a Mornay sauce, the most common variation on Bechamel. Mornay sauce includes cheese. It could be cheddar (as we use in our mac-n-cheese) or Gruyere as we use in our usual basic cheese soufflé. Depending on the cheese, you need one-two cups of shredded cheese. Add a teaspoon of dried mustard, perhaps a splash of Tabasco sauce or Worcestershire sauce or wine. Some fresh herbs work. Add broth or stock (such as chicken broth or turkey stock) to the roux, and you have perfect, lump-free gravy. The "take-away-point" here is a one-to-one mixture of lipid and flour, thoroughly combined and lightly cooked is a roux. Add some liquid, and you have a sauce. Easy-peasy. This roux is traditional French cooking, and its purpose is to thicken. The roux itself is intended to be almost tasteless. The Creole cuisines of Louisiana and the Caribbean have different ideas. In Creole cuisines, the roux may be pale and almost tasteless when it's being used in a traditional French manner but is often cooked far longer. Paul Prudhomme writes of tan, red, mahogany, and even black roux. These are cooked far longer than the French version and are more often made with oil or fat rather than butter. Traditionally, a Creole roux is made in a pan over medium-high to high heat on the stove-top. It requires steady stirring and as Prudhomme warns—it's Cajun napalm if you splash it on yourself. We heat the fat/oil in a pie pan in a 375 F oven until the fat melts, whisk in the flour (same proportions as for béchamel), and then bake it, whisking every five minutes, until it's the desired color. Instead of taking 10 minutes to make a dark roux it takes 30 minutes using this method. But its more forgiving and while it's baking we can prep the other ingredients, wash some dishes, have a beer, especially if you're not in a hurry or we're sure you'd be doing something far faster than gumbo of jambalaya anyway. The main difference beyond color between a French and a Creole roux, the Creole roux's job isn't thickening, its flavor. The darker the roux gets the less thickening power it has and the more rich, nutty, savory flavor it contributes. Creole roux is about flavor and not thickening. Great cooking is really about knowing your ingredients and how to make those that are made and not simply pulled from the ground or sliced from a lamb. Here is a sauce ingredient with one name, one technique, and serving two different purposes—how cool is that!